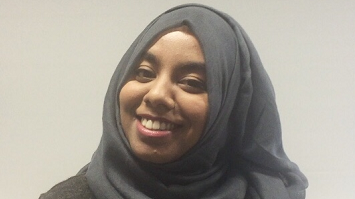 After graduating from City and Islington College with a BTEC Diploma in Business, Nadiya Ahmed turned her attention towards fulfilling her career ambitions. "I've always wanted to be a teacher," explains Nadiya, "but I also know that it makes sense to keep my options open at a young age. That's why the BA (Hons) Education Studies course at LSBU was the ideal choice for me. After graduating, I can go on to study for my PGCE, but if I change my mind about my next move, I still have the flexibility to pursue other options." Nadiya had heard from friends at LSBU that it was a great place to study and she has been delighted to find that their endorsement was entirely deserved. "Everything is very accessible and easy to get to," she says. "The library is great and there are plenty of rooms across campus that you can use to study in. The academic staff on my course are also fantastic – the course director and the lecturers are helpful and supportive." Everyone at LSBU is so friendly, which makes it a great environment to push yourself – you have all the support and confidence you need to achieve. Nadiya is a firm believer that to make the most of her time at university she needs to be prepared to put something back, which is why she enjoys acting as the Student Rep for her course. "It was something I volunteered to do and I'm really enjoying it," she says. "It has given me more confidence and helped me become a more capable communicator – it is definitely something I want to build on more." As well as the skills she has developed from her work as a Student Rep, Nadiya feels that her work placement, organised as part of her degree, has been extremely useful. "It was a very helpful experience as well as being great fun," she recalls. "It enabled me to learn about different classroom settings and has really helped me to picture myself as a classroom practitioner. I'm also hoping to undertake some voluntary work over my summer break and am currently looking into the options available to me." Nadiya's positive experience on the course so far and her work placement have reassured her that teaching is the right next step for her, and she is hoping to take her PGCE once she has graduated. "My aim is to start my teaching career here in London for two or three years, before moving abroad to teach in another country, as my qualifications are accepted in so many countries. I'm very excited about my future." she says.